Pagodas at sunrise. All photos by Adrian Granzella Larssen. 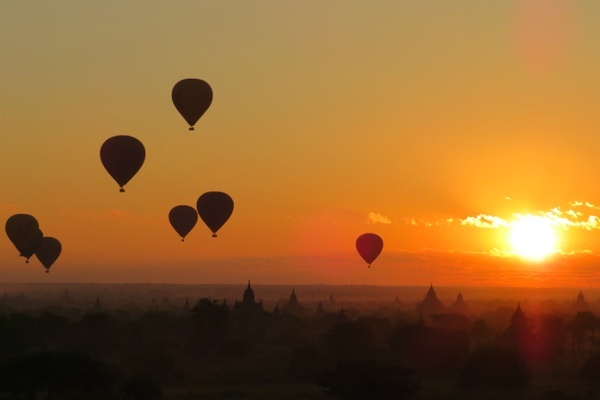 Myanmar is changing and changing fast, but one thing is for sure: There's no sight quite like hundreds of hot air balloons rising over a valley of ancient temples at sunrise. 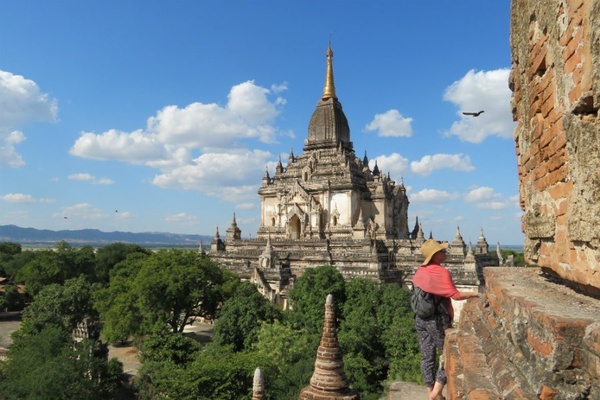 Adrian Granzella Larssen just returned from a trip to the ancient city of Bagan and her number one tip is simple: Ditch the guidebook. 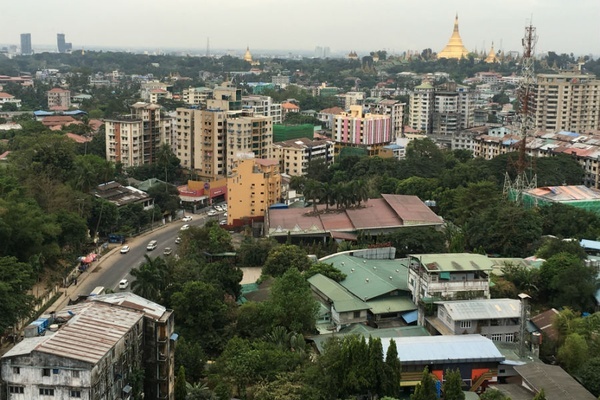 YANGON, Myanmar — When my friend Andrea moved to Yangon four years ago, she didn't have a smartphone. And why would she, when there wasn't 3G? Even the internet in her apartment was spotty at best. And forget hailing a Uber — she drove herself around because there were only a handful of taxis in the city. But when my husband and I visited her early this year, all of that had changed. My iPhone worked just fine. The WiFi in her apartment was speedy enough for all of our devices to connect (well, most of the time). And there were so many taxis that traffic was constant — she recommended leaving over an hour to get to the airport, which used to be a 20-minute ride away. In short, everything in Myanmar is changing, and fast. We had one night with Andrea in Yangon before heading to Bagan, the ancient city that's known for its 2,200 remaining temples scattered over a picturesque valley. She gave us a rundown of what to know about traveling in the country: What to eat (try the Burmese salads, Shan noodles, and vegetable curries), what to wear (cover your knees and shoulders — some temples even find leggings too scandalous), and what to expect (you will most likely get sick — everyone does). One thing that she forgot to mention was something we found out the next day at the airport, when we checked in and an agent handed us boarding passes. Our names were listed correctly, as was our destination, but they didn't show the same airline or time we had booked. Confused, I showed her a print-out of my original reservation. She shrugged. "Not that flight. This flight now." No big deal. This apparently happens all the time. 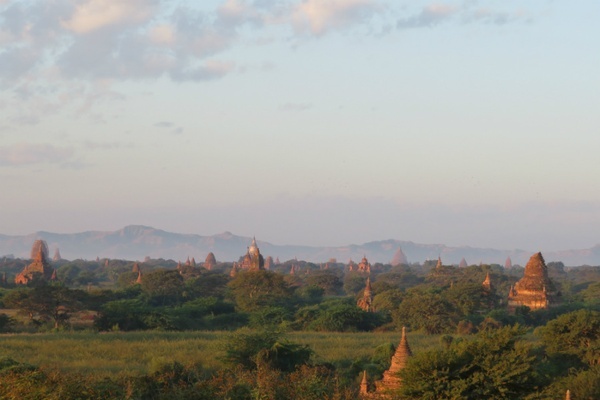 We soon realized that much of what we read in the guidebooks about Myanmar is sorely outdated. Many of the airlines listed had merged, folded, or changed their names. The restaurants that were lauded as the best were nowhere near as good as new ones we found. Good-natured traveler's tips ("Bring all the cash you'll need as there are no ATMs in town") were no longer true. As someone who typically doesn't set foot in a restaurant without checking its Yelp reviews, this wasn't easy for me. When we set out to explore, I was still determined to stick to the recommendations. Climbing pagodas is part of the experience. Everyone gathers to watch the sunrise. 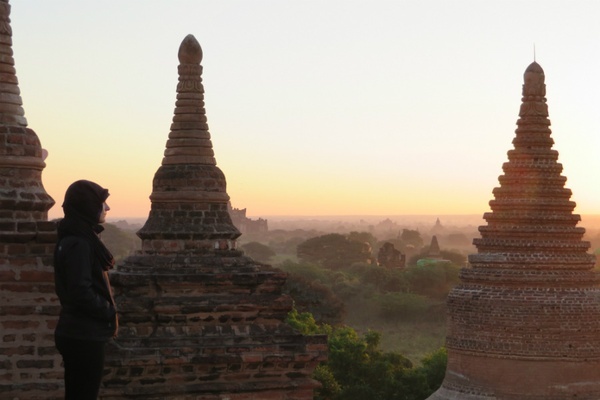 The main activity in Bagan is watching the sun rise and set, climbing up one of the stupas and taking in the views of the valley from the top. For our first sunrise, we picked one mentioned in our guidebook (and confirmed by Travelfish and our hotel map) and headed out before dawn. We pointed our e-bike (basically a battery-powered scooter, the main means of transportation on Bagan) down the main road and turned down a dark dirt path. A hundred or so yards in, it was clear we weren't alone. The temple was alive with others who, just like us, had been up long before dawn to secure a seat at the guidebook-recommended spot. We climbed up to the top where 30 or so people were already perched and watched as the area below us filled up with dozens more e-bikes, bicycles, and horse carts. By the time the sun came up, there were more than a hundred others with us. 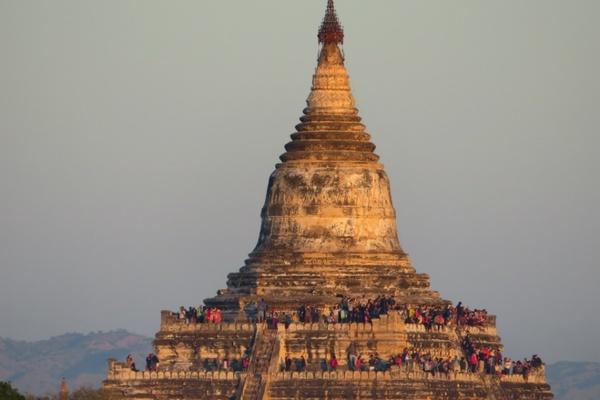 After hitting a few more stupas heralded as "must-sees" — some of which were covered with scaffolding, others overrun with tour groups — we decided to scrap the guidebook for the rest of the trip, and see where the days took us. All the colors are richer at sunset. We saw temples that weren't on any maps. We had long conversations with locals, not other tourists. We watched the sunset atop a pagoda with only a handful of people. On one of our favorite adventures, we went to a temple recommended by a French couple, one that hadn't been in any of their guidebooks, but that someone had recommended to them the day before. "It's all the way on the other side of town," they said. "You'll go over this rickety bridge, up and down some crazy hills, and get lost a hundred times, but it's totally worth it." They were right. We scooted through villages, up and down hills, over crazy bridges, and turned up half a dozen wrong roads. No one we passed spoke a word of English, but everyone used smiles and gestures to help us find the way. 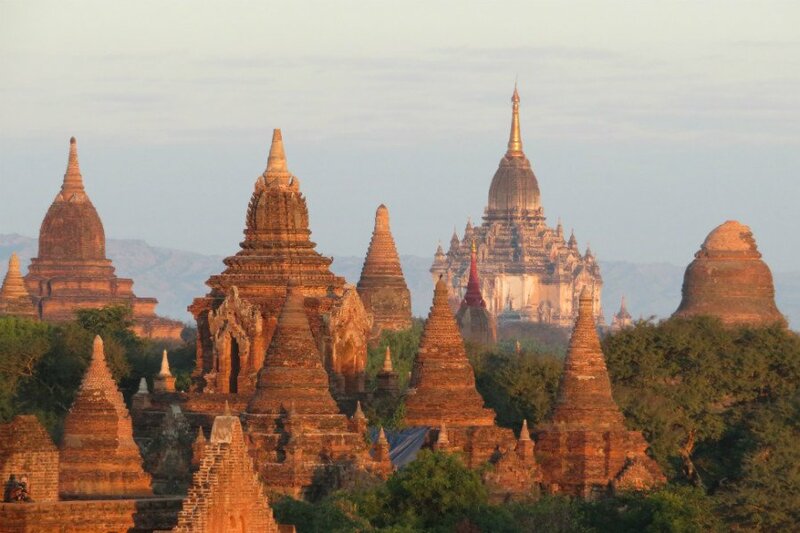 There are over 2,000 ancient temples in Bagan. When we got there, we were greeted by a monk with betel nut-stained teeth and a handful of newborn puppies playing at his feet. He smiled his big red smile, pointed us up the hill, and served as our private tour guide for an hour or so, taking us to an incredible pagoda tucked behind the village and into a cave leading to a tunnel, leading to views of the massive river below. It was, indeed, totally worth it. 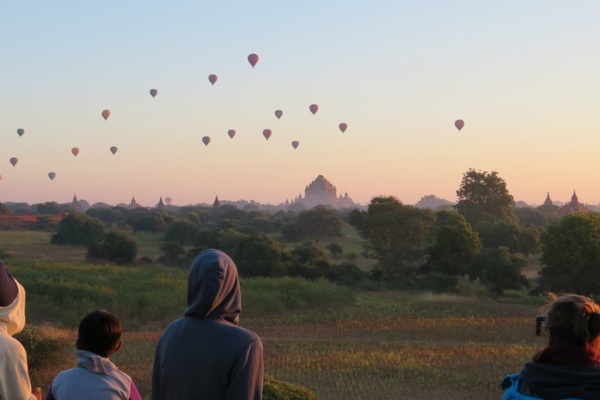 You can tell that Bagan, like the rest of Myanmar, is preparing for an onslaught of visitors. New restaurants and hotels are cropping up, new billboards and street signs dot the roads, and new government signs detail suggestions for sustainable tourism. The locals are furiously practicing their English. Soon, there will be more tour buses, more traffic, more people. Soon, you may not be able to climb up the temples the way I could. So my advice to anyone who wants to visit is to go now, before it changes too much. But that's all the advice I'll give. I could tell you about my favorite restaurants, but you'll find your own. I could tell you what airline to book through, but the carriers will surely change by the time you go. I could tell you about my favorite stupas, but who knows? They might be under construction. You might find something better on your own. And if you, like me, hate the thought of an unplanned trips, I'll say this: With each experience, I got a little more comfortable with the idea of having a little spontaneity in the day. Gratitude replaced my neuroses, my FOMO, and my apprehension of letting things unfold as they may. I found gratitude in that unexpectedly quiet temple we had all to ourselves and gratitude in the sunrise witnessed with friends we had met the day before. And gratitude that there is still a world where you can find temples, places, corners, that no guidebook has written about. At least for now. Taking in the view on a chilly morning. Watch the sunrise and sunset. Every. Single. Day. Even the first day, when you're tired and want to sleep in. Scrap the guidebook. Meet locals and ask for their favorite restaurants and sunrise/sunset viewing destinations. Lodging in Bagan is divided into three areas: Old Bagan, New Bagan, and Nyaung-U. The latter is known for having the most mid-range and budget accommodations and more of a local town feel than the others. We opted for Hotel Zfreeti in Nyaung-U, which was a solid mid-range option with awesome breakfast, morning yoga, and a pool. It was just down the street from Bagan's version of "Restaurant Row," and across the street from a shop that had just about everything we needed: e-bike rentals, laundry, snacks, and taxis. Again, things change, and you'll probably find all kinds of new places. But a solid spot that's been around for awhile, and hopefully will be for a long time, is The Moon (+95-9-42070-9847), a vegetarian cafe in Old Bagan. The curries were delicious. Fly into Nyaung-U from Yangon or Mandalay. Beware: The airline you book may or may not be the one you fly on, and it'll most certainly not be the time you expect. Have your hotel call the airport before your flight to check the schedule. Bagan isn't a walking town. You'll need to get around via bike, e-bike, taxi/driver, or horse carriage. E-bikes will give you the most flexibility if you want to do lots of exploring. Layers. Pre-dawn e-bike rides are chilly, and afternoons are hot. You'll need to cover your knees and shoulders before going into temples, so dress accordingly. You'll also need to remove your shoes before heading in, so wear something you can easily slip in and out of, like flip-flops or Toms. Adrian is a writer and editor who lives in New York but proudly keeps her 310 area code. She is the founder of Sweet Spot Content and editor-at-large at The Muse. Follow her on Instagram. She travels for the instant inspiration that comes from a change of scenery… and the street food.